As students get older, it becomes more and more difficult to get them to reread materials. However, rereading of familiar texts on one’s independent level is one of the best ways to increase reading rate and accuracy. It also provides opportunities to practice expression, tone and prosody, all important components of oral reading. Students who have difficulty with fluency may have trouble with recalling sight words. Repeated readings of known sight words in familiar text can help build automaticity in reading these words. That’s why this script is written on a second grade level, even though it’s intended for grades 3-5. Both characters have unisex names, so any student will be happy to play either role. 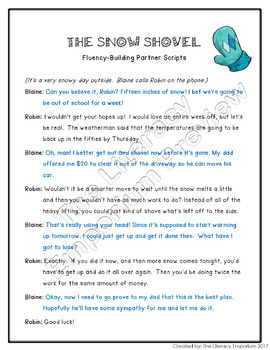 In this particular script, Blaine and Robin spend a phone call plotting the easiest way to shovel the sidewalk. 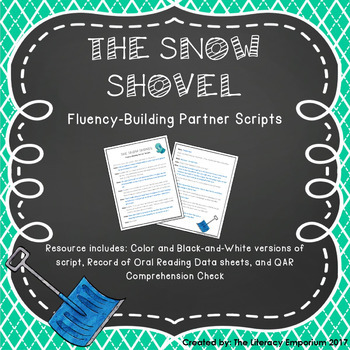 Scripts can be used for independent practice, as a literacy center, for guided practice in small groups or as intervention. 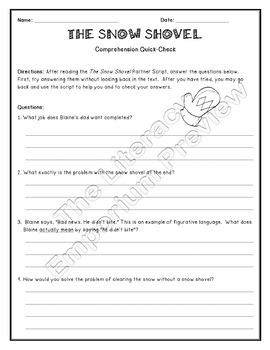 Product includes: color and black-and-white versions of the script, Record of Oral Reading for data collection and a QAR Comprehension Check. If you enjoy this product, please check out my other phonics games and activities at my Teachers Pay Teachers store, The Literacy Emporium. Follow me on Facebook for product updates, giveaways, and teaching techniques, and on Pinterest for other great literacy ideas.